How to increase customer satisfaction? Probably every business is asking this question at a certain stage of their existence. There are so many tips online on how to boost customer satisfaction that sometimes one can get lost in the flood of information. What if we try to look at this question scientifically? Recent CX Act research 2015 “Omni-Channel Customer Care Study” revealed that there are 3 most important drivers of customer satisfaction. At least now we have something to focus on and prioritize our efforts. Let’s look at each one of them. How can you ensure that your customer service is swift and easily available? What exactly does it take? According to research, customers perceive a support transaction as quick and easy if they can get personalized support based on the availability of their personal information and transaction history. So one of the first things you can do to get higher customer satisfaction rates is to make your support easy to reach and equip your support agents with tools which provide access to the customer details. Customers expect contacts to be easiest to handle via online live chat, email or mobile self-service. Hence, you should consider developing these channels if you would like your company’s customer service to pass for quick and easy. First contact resolution in a way is also a part of customers’ perception of support as quick and easy. Naturally, if their question or problem is addressed and solved right away, they will consider such support fast and easy and will be more inclined to rate the service higher. Customers are most likely to expect first contact resolution from either live chat or via telephone, so make sure your service agents are qualified to provide the best customer care over those channels. Especially when the reason for contact is a complaint or a question, customers highly value human contact. They expect to receive warm and friendly experience. How can you meet this expectation? Most importantly, you need to hire qualified agents. How to identify the best service staff, read on in our post “How to hire the right people for customer service”. And of course, whomever you hire, you need to give good training which will cover your company’s product /service and policy. Teaching soft skills and motivating your customer service team for their best performance will also help to meet the customer expectation for a friendly and professional human contact. Now you know the 3 most important things to pay attention to in your efforts to drive customer satisfaction. It can save a lot of effort if you choose a few customer service channels where you have a greater possibility of meeting the above expectations and focus on developing those channels. Of course, multi-channel customer service is still important. However, usually spreading yourself too thin does not yield great results. It helps to choose and prioritize two or three channels which allow for good human interaction, fast and convenient real-time support and have advanced technical capabilities for showing customers details. If the above 3 factors receive the necessary attention, a boost in your customer satisfaction rates is guaranteed. 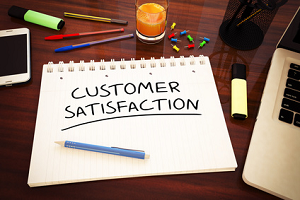 What do you consider the most important drivers of customer satisfaction? Does your company experience differ from the results of CX research? Let me know of your observations in the comments. This entry was posted in Articles, Tips and Tricks and tagged customer satisfaction drivers, customer satisfaction factors, customer satisfaction rates, how to increase customer satisfaction. Bookmark the permalink. I strongly recommend training and re-training of staff inoder to educate them on the value of rsolving customers complaints as fast as possible. Agree, Adetuyi. Constant training is the only way of instilling the right values in your team. Thank you for your comment. i agree with your post Maria ,greaat post ! customer service is key any online business . Thank you, Paul. I am glad that you enjoyed the article. Maria, really good points and I completely agree on these. Happy customers are our best brand advocates and to keep our customers with us and satisfied, we need a good customer service process within the company. Thanks for this post and the points, this really helped me to get couple of new ideas for my education business. Thank you for your feedback, Sam. I am really glad the post was useful to you. Maria — great article. Don’t you find it curious that the more we apply technology the more we need the human interaction — that technology just makes this element far more important. Theresa, this is a great observation. It didn’t occur to me in that form, but I can’t help but agree with you. The more we try to automate things, the more involvement it requires from us. It seems that we just can’t escape from life 🙂 It needs us and our involvement. Thank you for sharing your thought. You embedded an additional factor in your first factor access and speed of support. The major point you skipped over was skill of the support personnel. You can give quick response with a dummy but you need both speed of response and highly trained support personnel. In fact, the skill level if more important. That shows up in first time resolution (which again is really primarily about skill level and training of the support personnel). Happy New Year! Thank you for your comment, Bill. I was writing more from the perspective of the customer. However, I do agree with you, that skilled personnel is the factor which basically enables the rest of them. So indeed it is most essential. Happy New Year to you! Hi Maria! One of my pet peeves is how limited frontliners can act. It’s not until I can get to a supervisor can I get resolve and usually very quickly. Where do you think “Employee Empowerment” fits in with this? Very spot on comment, Abraham. Thank you. I think employee empowerment is one of the things that contribute to first contact resolution, empowering agents to seek solutions and take responsibility for them. So it is also a very important driver of customer satisfaction. Thank you for pointing it out. Hi,The third point is very important which is Human contact to make customer satisfied while reaching for service or support. Nice Article ! !